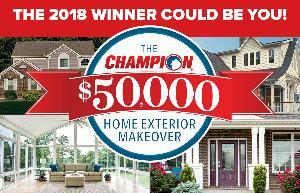 Prize: Fifty Thousand Dollars ($50,000) worth of Champion Windows and Home Exteriors products. What you must do to enter: complete form -- you must live within the service area of the sponsor to enter/win. Statistics: This contest was opened by 40 and entered by 1 ContestChest.com members. 2% of those who opened the contest, entered it.